This will be my last post from the Outer Banks. I have saved the ABSOLUTE best for last. 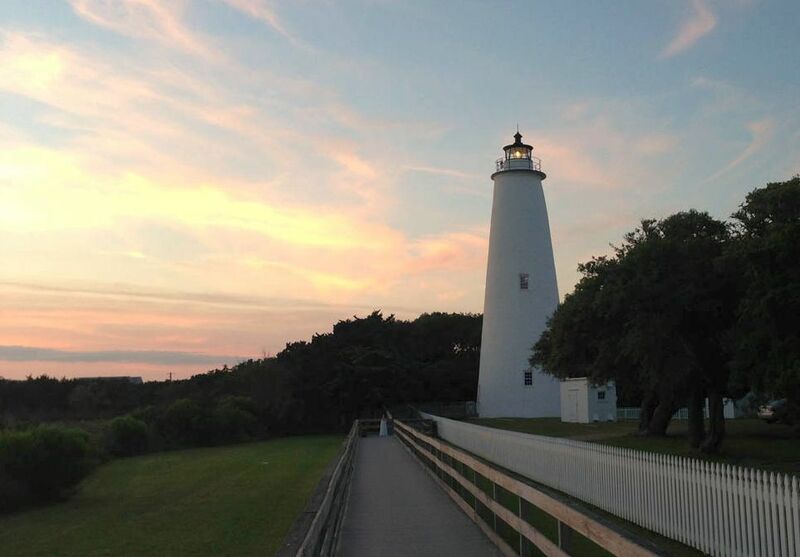 You see, I am a self-proclaimed “lighthouse nut.” I have always had a thing for them since I was a kid growing up when we would make our bi-annual family outings down to South Padre Island. One of the routine stops was always the Port Isabel lighthouse, last stop before the Queen Isabella Causeway leading over to the island. I can still remember how excited I was as a kid when I actually got to climb it. So of course, the highlight of my five week “beach crawl” in the Outer Banks has been the time I have spent literally “stalking” the lighthouses. 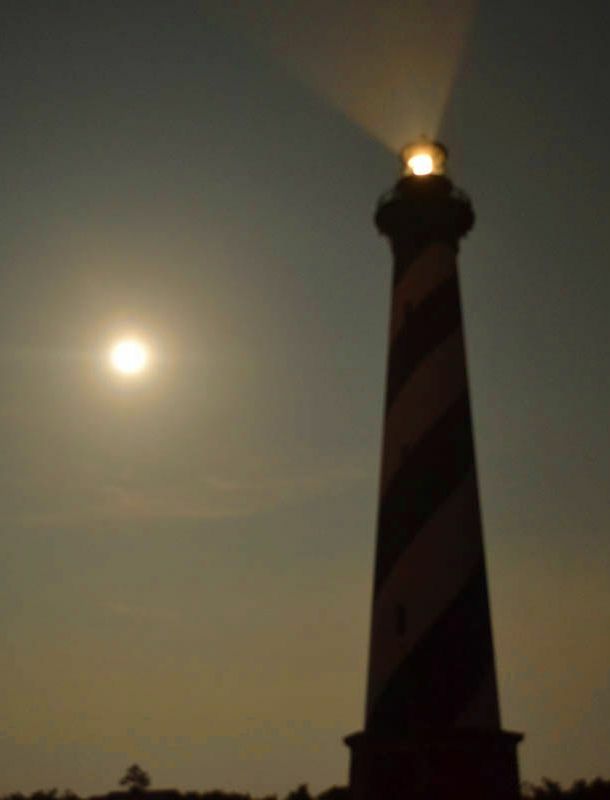 I identify with so many aspects of the role of the light keeper, as stated in the information board in Cape Lookout, “required hardiness, skill with mechanical devices, a tolerance for boredom and loneliness, and physical courage.” The romantic symbolism of “keeping the light on,” guiding the ships to safety also resonates with the sailor in me. And of course, the keeper’s quarters are the loner’s dream. I would go in order of north to south or chronologically according to year built, but since this blog is all about preserving my rapidly fading memories, I am going to go in order of my visit. 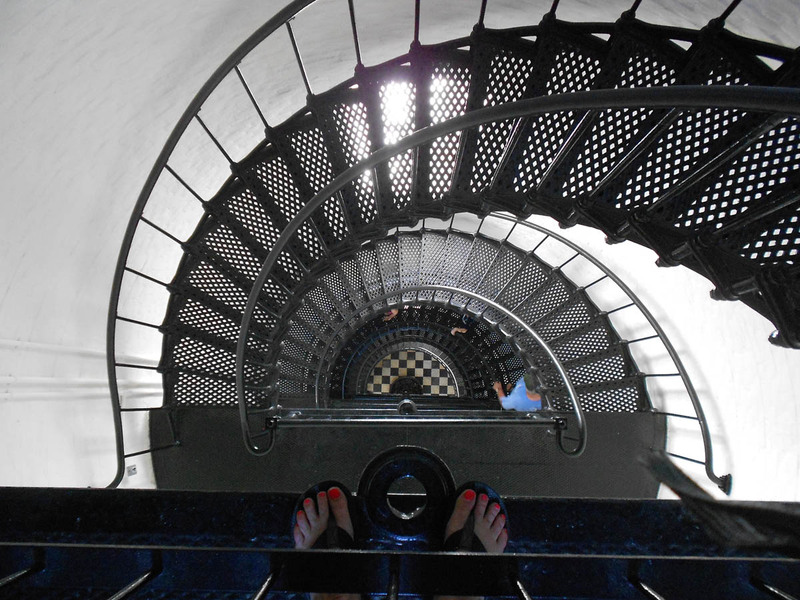 BODIE LIGHT – Built in 1872 , 156 ft tall, 214 steps. Daymark = Black and white horizontal stripes. Flash 2.5 on, 2.5 off, 2.5 on, 22.5 off. This one was a particular treat, as it has only been open to the public since April. It just got spiffed up for the opening with a new paint job and renovation for its grand welcome to tourists for the first time in history. They haven’t installed grates on the windows yet, so they are sealed closed, requiring vigilant monitoring of the heat index factor. For this reason, it is not possible to climb unescorted, but rather led by a Park Ranger, as they take temperature and humidity readings on every tour. Once the heat index reaches 103 degrees, the tours are done for the day, which is precisely what happened to me on my first visit. So I got up at the crack of dawn the next morning to be on the first tour. One look at that glass beehive-shaped structure made completely of multifaceted glass prisms, its rainbows reflecting on all surfaces, and I swear, I heard an orchestral score. 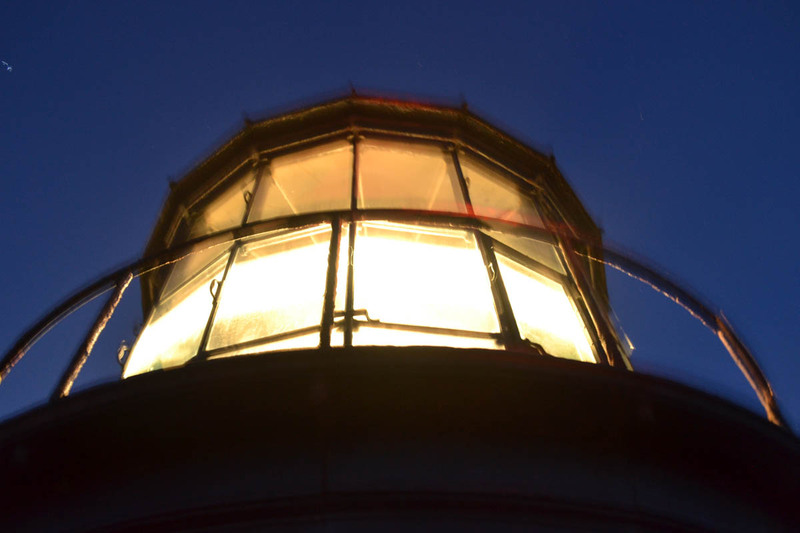 The Fresnel lens was designed by Augustin Jean Fresnel (“Fray-NEL,” French, therefore the “S” is silent) back in 1822 to magnify the intensity of the oil lamps used back in the late 1800’s. The prism concept enabled an oil lantern, originally whale oil but later kerosene, to be seen 20 miles out to sea. Back then, the lamp was stationary while a system of weights similar to a grandfather clock rotated the lens to make the light appear to “flash.” These weights had to be cranked up by hand every 2-3 hours. The lenses come in seven sizes, or “orders,” the largest being the “First Order,” with a diameter of six feet and up to 12 ft high. There are only a few of them left in the world, Bodie being one of them. 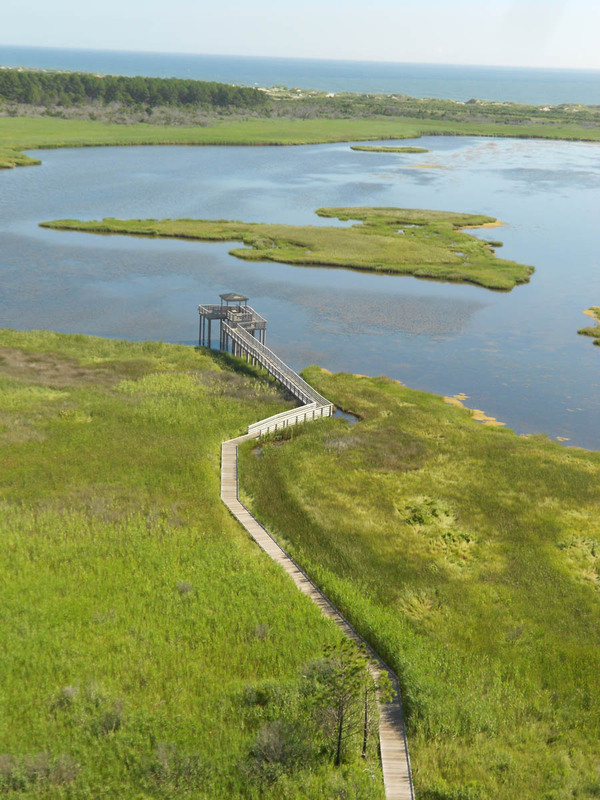 The view from Bodie Light is exceptionally beautiful also, overlooking the marsh below where egrets can be observed in addition to the miles of coastline. Bodie Light is like the young teenager, all scrubbed and dressed up for his first prom in tux and top hat. Once I decided I was heading south for Ocracoke rather than my originally planned northerly route, I made a mad dash up the island to Corolla to see the Currituck Lighthouse. Unfortunately, I didn’t make it there in time to climb it. But as I was down on all fours capturing a photo of the entryway, the door opened, and out came the caretaker. I wasn’t able to talk my way to the top, however he did take me through the exhibits which included turn of the century equipment and Lightkeeper uniforms. 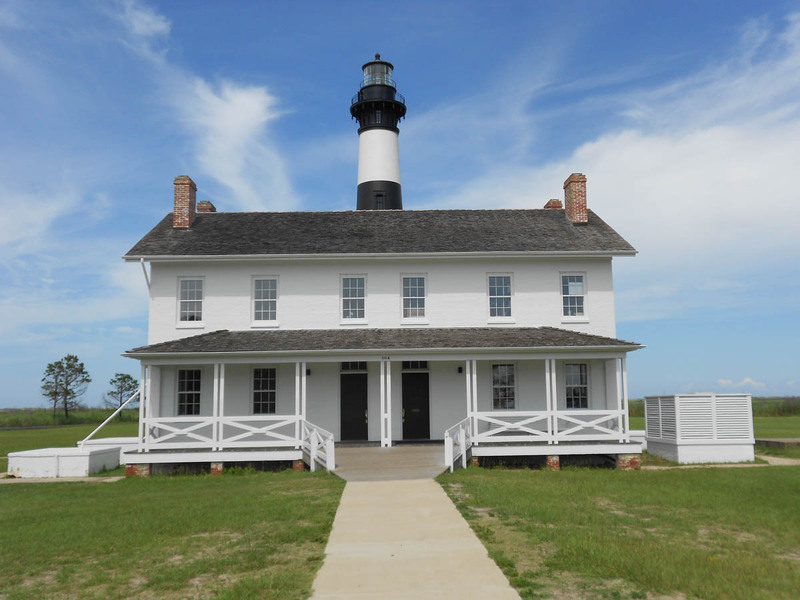 Currituck and Bodie light are identical in their design, as both were ordered as “ready to assemble” pre-measured, pre-cut kits, containing over 1,000,000 bricks. 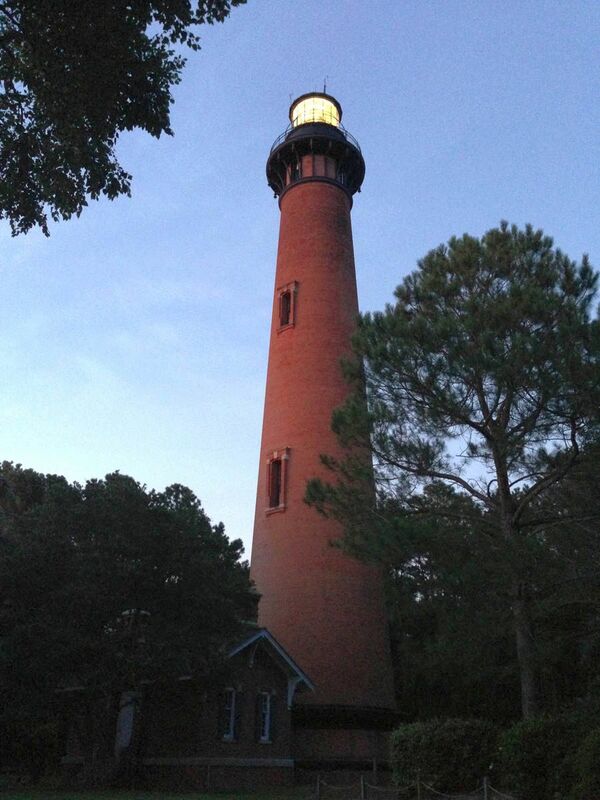 Currituck Light is like the dowdy but dependable older sister who wears no make-up, yet is authentic in her beauty. 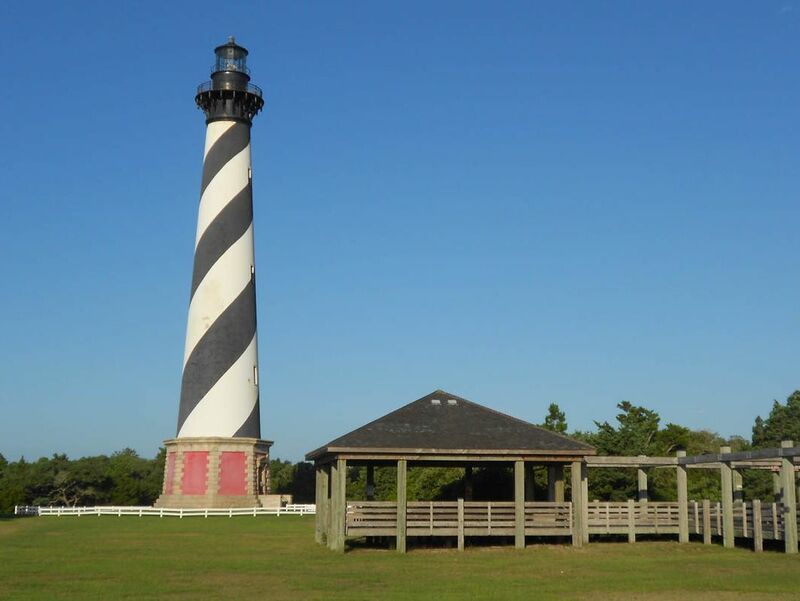 CAPE HATTERAS LIGHT = Built in 1870, 198.5 ft tall, 269 steps. Daymark: Graduated stripes. Flash: 7.5 sec. As if once up 269 steps was not enough, I actually got to climb this one three times! 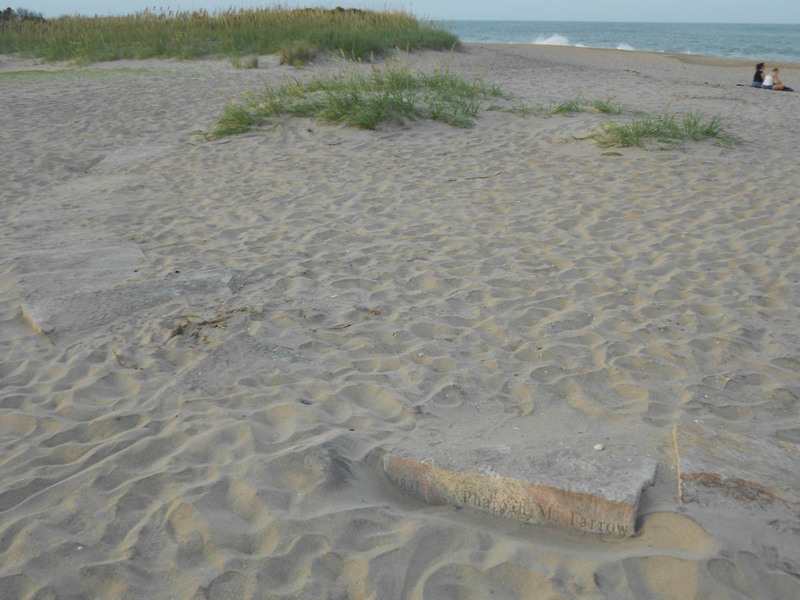 In addition to an early morning climb, I had the good fortune to be staying in Cape Hatteras during the full moon, when the NPS offers two climbs, one at 8:30pm and another at 9:30pm. Since thunderstorms were predicted and they are known to shut down the tower with lightening 30 miles away, I bought a ticket for both climbs to make sure I wasn’t disappointed. The First Order Fresnel lens was vandalized in the 1940s. No longer considered an effective means of lighting the towers, replacement parts were no longer available, therefore it was replaced by a 1,000 watt rotating airport beacon. 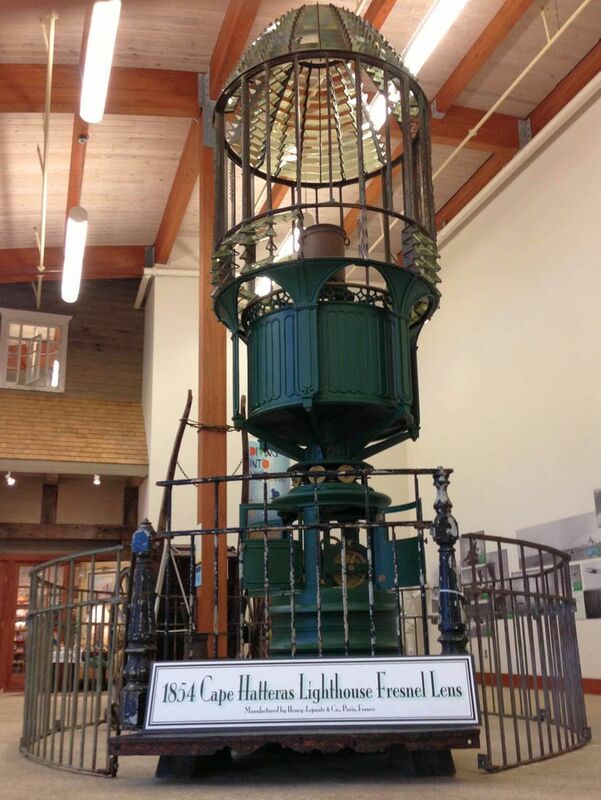 The 12 foot tall original lens now occupies the lobby of the Graveyard of the Atlantic museum in Cape Hatteras. 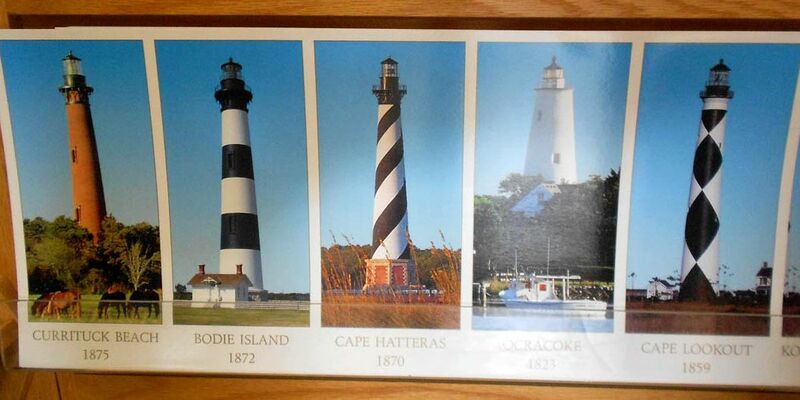 Hatteras Light is unique in that the lighthouse was actually moved in 1999 to protect it from the eroding coastline. The Visitor’s Center has a fascinating documentary showing the efforts it took to move the vertical structure 2,900 feet in 23 days, a rate of five feet per minute. There was some controversy surrounding the move as some locals resisted the new, further inland location. Many still make a pilgrimage of sorts to the old site, marked by a circle of granite stones, each carved with the names of the original lightkeepers. It is easy to see why it was necessary to reposition this iconic landmark away from the threatening coastline. But also understandable as the location feels much more geared toward a tourist beacon now than a navigational one. 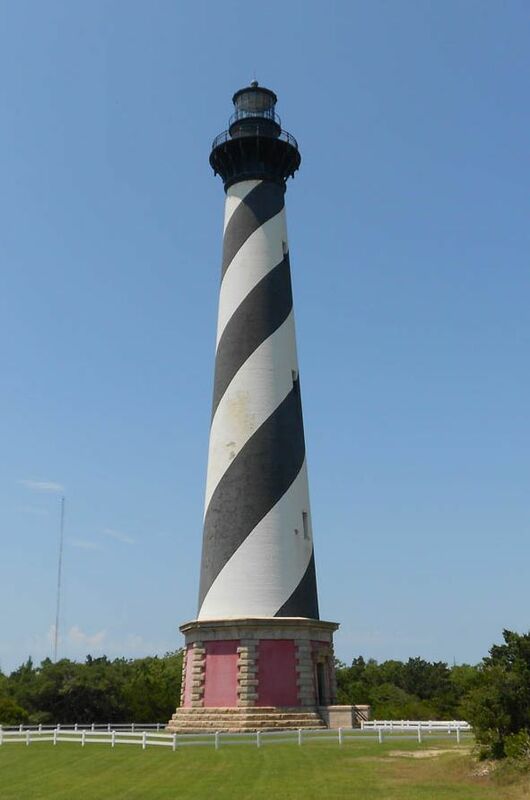 Hatteras Light is the whimsical “ showy one,” like the narcissistic fashionista, commanding the center of attention from all directions. 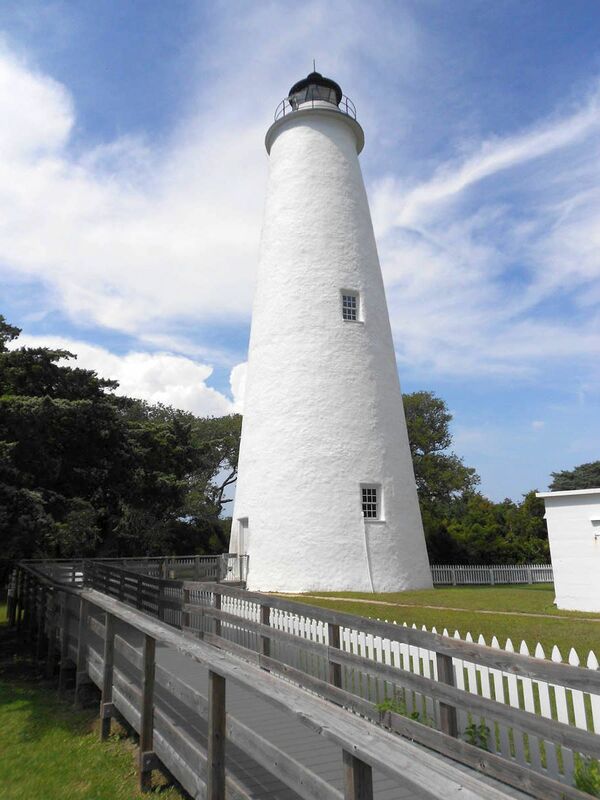 Whereas the purpose for most lighthouses is to warn mariners to “stay clear,” the Ocracoke Lighthouse serves the opposite purpose, guiding ships into the inlet. 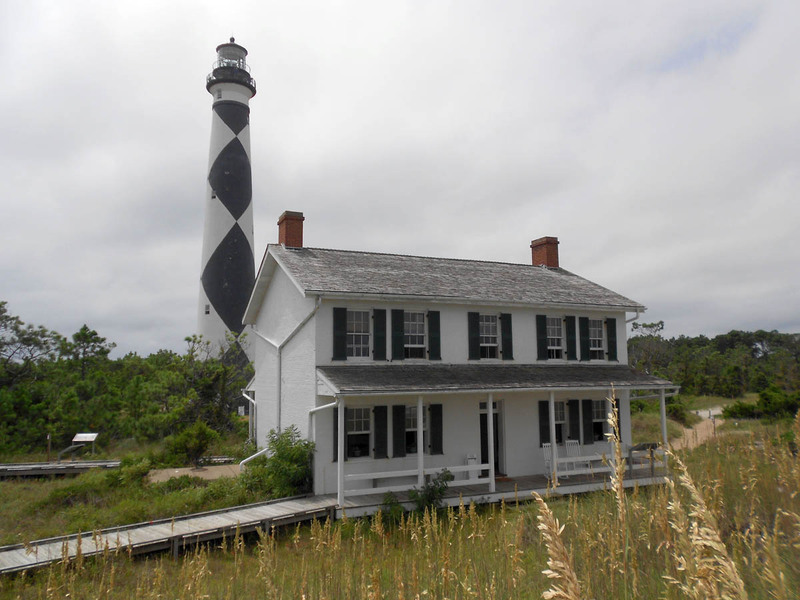 It is the oldest operating lighthouse in North Carolina. 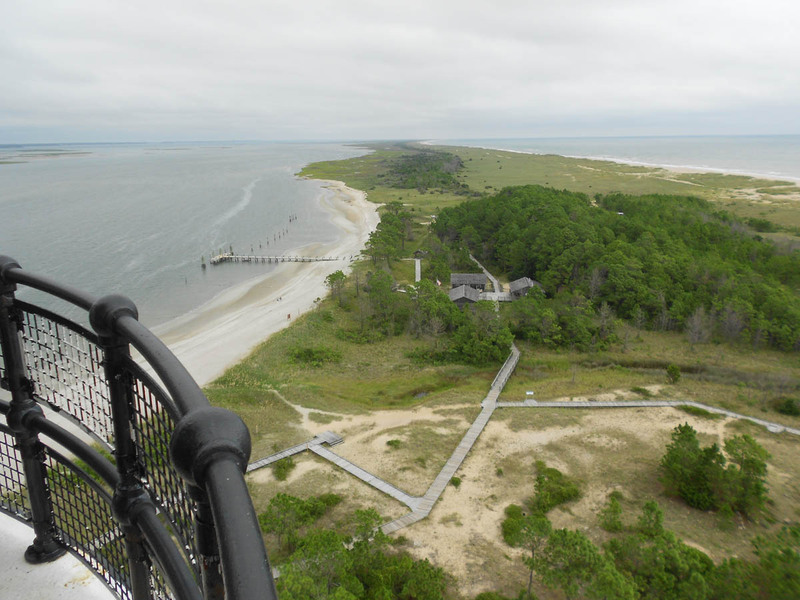 CAPE LOOKOUT LIGHT – Built in 1859 , 163 ft tall, 207 steps. Daymark = Black and White Diamonds. Flash: Every 15 sec. I had to work hard at seeing this one, located on Cape Lookout National Seashore, by far the most remote, only accessible by boat. It is the very reason I repositioned over to the mainland from Ocracoke, to be near Harker’s Island, the closest access point. Next, foul weather moved in, and all the passenger ferries ceased operation temporarily. Finally, my third attempt on my last possible day in the area made the climb that much more sweet. Or a white lighthouse with black diamonds? Cape Lookout Lighthouse is also unique in that it is the only structure that offers both directional daymarks as well as differential. The black diamonds face North/South while the white diamonds face East/West. Cape Lookout is the serious one. No time for such frivolities, this one has a job to do! 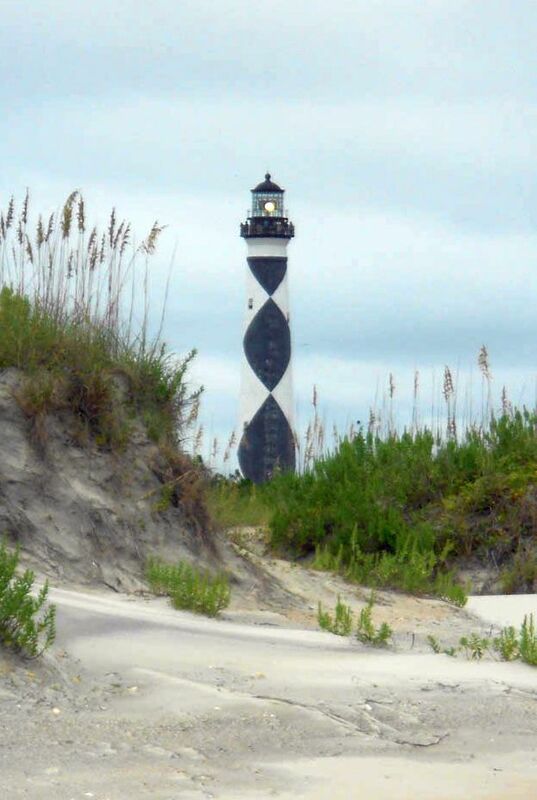 Each of these lighthouses is so steeped in history, from struggle over control of the Fresnel lenses during the Civil War, to extinguishing the lights altogether during World War II. But that would be an entire post in of itself. Suffice it to say, I am smitten. Nevertheless, I must move on. 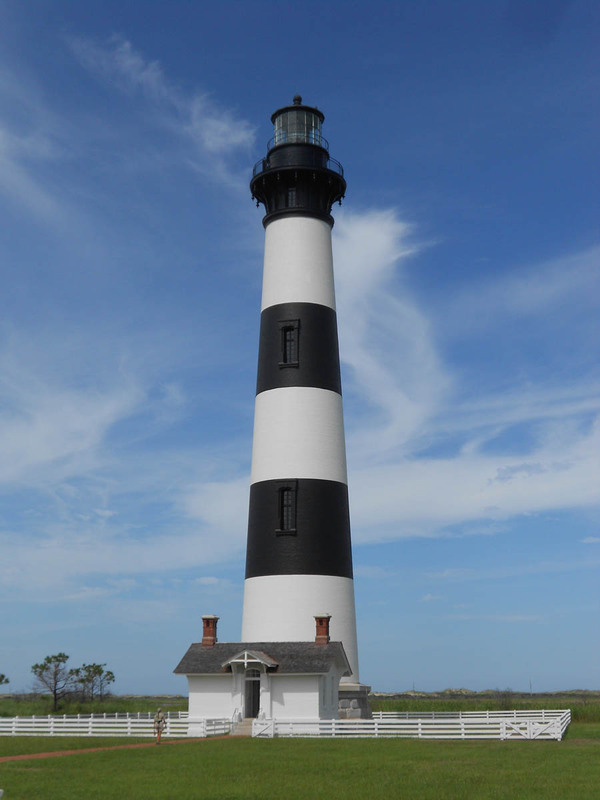 I’m headed up the Virginia coast next….in search of more lighthouses. 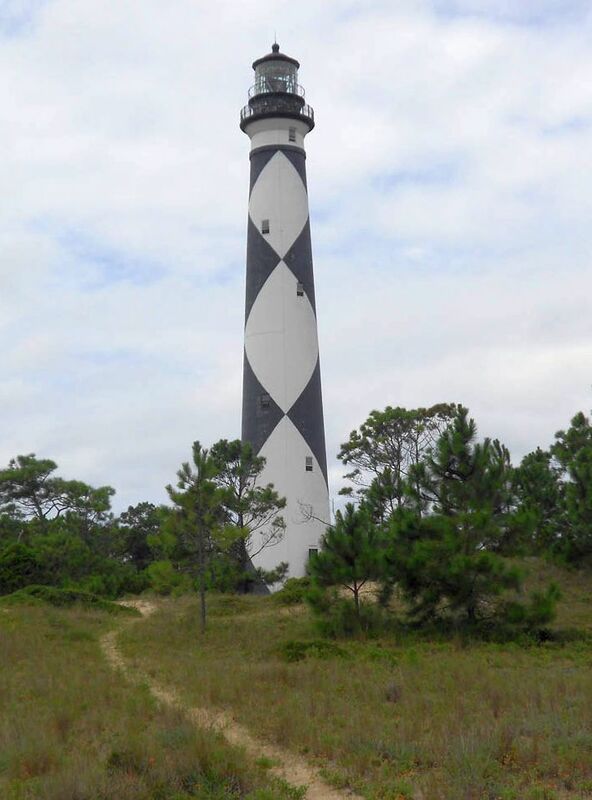 This entry was posted in North Carolina, Outer Banks and tagged Bodie Lighthouse, Cape Hatteras Lighthouse, Cape Lookout Lighthouse, Currituck Lighthouse, Ocracoke Lighthouse, Outer Banks Lighthouses by Suzanne. Bookmark the permalink. Such wonderful photos! I have never been fascinated by lighthouses, but after reading your blog, I have an itch to go visit some. I love the final descriptions you gave of each one. Hi, Candy! Thanks for stopping by! When do you leave for the rally? I started to name them all after specific family members, but figured that might get me in too much trouble. LOL!! Have fun at Grand Marais! I now have an “ear worm.” That song has been in my head for 5 weeks now. I had to leave the Outer Banks, just to get some relief. LOL! What order of Fresnel lens would fit in my cabin window? So beautiful I could swoon. What a wonderful tour of these lighthouses. 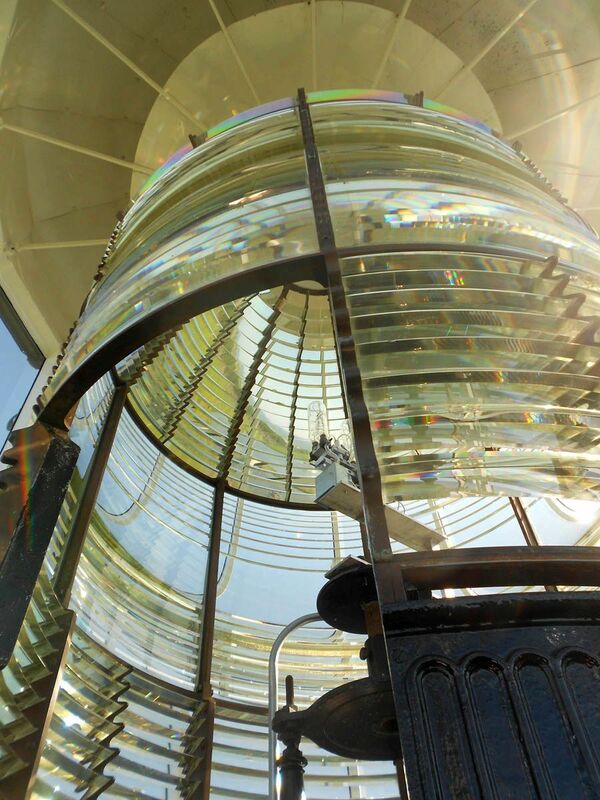 Now-a-days lighthouses are under rated but they are a great piece of our history and the Fresnel lenses are a beautiful piece of functioning artwork. I work at Yaquina Head Lighthouse in Newport, Oregon and love sharing the history of lighthouses with people who are on my tours.